RHYS BOWEN: Today is it! Official launch day of my new stand-alone historical novel, THE VICTORY GARDEN. I've written two novels set in World War II but this one goes further back in time to the first great war. My inspirations for it were two-fold. The first was when I came across a book on herbal remedies and recipes at a used book store. It was a serious tome with everything from heart tonics to skin creams and a history of pretty much every herb. Some of the recipes went back to the sixteen hundreds. So I found myself thinking 'what if someone moved into an old house and found it was surrounded by a herb garden? And what if the wise woman, the herb wife, had always lived in that house and my character finds she has to take over the role? So I toyed with this idea for a while, letting it simmer, until we were having all the ceremonies for the centennial of the end of World War 1. I was struck by how senseless this whole conflict had been: a war that began over the assassination of an obscure archduke in the Balkans and decimated Europe for four long years, achieving nothing really. More men were killed in this war than in any other conflict. A whole generation of young men did not come home to Britain (nor to Australia, New Zealand or Germany for that matter). It was a war directed by cavalry generals, sending men 'over the top' against Twentieth Century weapons. It was fought in trenches with mud so deep that people drowned in it. Those men who came home were broken in body and mind. So I found myself wondering what happened when the men did not come home. Who became the blacksmith, or the pub owner? Who worked in the fields? And I realized that women were called to do so many things they had not thought possible.I looked into the formation of the Women's Land Army. The women came from all walks of life. They were all grieving the loss of a husband, son, sweetheart. They were given a uniform that included bloomers, a battle jacket and big boots. They discarded their corsets, cut their hair and never looked back. They also worked in factories, ran businesses and did the jobs the men used to do. It was wonderfully empowering for them, and really contributed more than anything into getting the vote and male respect. So that became my story: a young woman meeting the love of her life, defying her parents, joining the land army and then, after terrible tragedy, finding herself in the house surrounded by the healing garden. Through healing others she starts to heal herself. It is set in the Devonshire countryside (near where my father's family came from) and is all about the strong bond between women. Of course, being me, I couldn't write a book without a mystery in it. Not possible. So my heroine finds the old book of herbal remedies along with a diary of a woman who lived there long ago. She ends up wrongly accused of murder and presumably hanged. Emily's life seems strangely to mirror hers, including the last episodes. Will she be able to prove her innocence or face the same fate? She broke off, as there was a knock at the front door. She opened it, expecting a visit from Alice, or maybe Simpson with more coal, and recoiled as a strange man stood in front of her. His jacket was tied together with string. He wore an old, shapeless hat over shaggy hair, and his face was half-hidden by an untrimmed beard. Emily recoiled at the smell of him. “Yes? Can I help you?” she asked, while the thought crossed her mind that she was far from any assistance. They would never hear her in the houses across the lane if she shouted for help. “I’ve got a sore thumb.” The man held it out to her. Emily looked. It was more than a sore thumb. It had a great, yellow blister on it, and the skin around it was angry, swollen and red. “That looks awful. You should see a doctor,” she said. I hope you enjoy the book. It's out in audio at the same time. And I'll give away a signed hardcover to my favorite comment today. I enjoy hearing about the process you have for working out the details of your book, how you considered and thought and researched and found a way to weave the history into your story. It sounds amazing and I’m really looking forward to reading it. And now I want to know how Emily handles the man with the sore thumb who thinks she knows about all the herbs . . . . Thanks for the link to the review. Kathy, your blog is beautiful! I am still learning how to blog. I updated my blog today after a long hiatus. Your review of Victory Garden is wonderful and I am more excited to read the novel! Happy book birthday! My eyes are tearing up just reading the description. I volunteer at a museum library and we have many WWI books. It’s always sad to pick up one of these (mostly about young aviators), look through his pictures, and find out he was killed. I’ve found myself in tears at the museum. But the stories are about valiant men. I am anticipating reading THE VICTORY GARDEN and loving it like all your previous books. Much success with its release. Happy Book Day to you and the Victory Garden, Rhys. I just ordered my copy. Now to impatiently sit and wait. I remember that WWI was called "The Great War" because humanity felt that it was so horrible, we would NEVER DO THIS AGAIN. not. I pulled by your thematic balance:healing vs devastation; past vs present; man vs woman; innocent vs guilty. All tied together with your impeccable prose. I predict another winner for Rhys Bowen. I LOVE this genesis story, Rhys. Thank you for sharing it. Can't wait to read the book! Congratulations on The Victory Garden! Your snippet has hooked me and I'll be off to get a copy as soon as the bookstore opens! I am so happy this is out! I have been waiting for it! I love victory gardens and the Land Army. Those women were so brave and were not afraid to roll up their sleeves and get to it! I love the story line. I cannot wait to see how Emily handles things. By the way, the cover is gorgeous! Congratulations on the new book, Rhys! It sounds wonderful! Congrats, Rhys! I have the book pre-ordered and can't wait for it to hit my Kindle! Great story premise, wonderfully attractive cover, and lots of information about herbs. I can't wait, Rhys! Shakespeare's works had a lot of information about herbs, and as a matter of fact, so does the Bible, showing their importance as far back as recorded history goes. I've grown them for the last 30 years, although mostly not for medicinal purposes. But all that knowledge could end up coming in handy again someday, the way things are going. Happy launch day, dear Rhys! Love that excerpt. "The herb wife"! I'm completely hooked. Rhys, you are amazing!! Rhys, you are an inspiration! I am honestly astonished and in awe—I cannot imagine how you do it. Seriously, how does that brain of yours come up with these things—, how much is intense research, and how much is your amazing imagination? Do you put yourself in another time and see it? Congratulations! Happy Release Day! I just found out I won a Kindle copy of The Victory Garden from Goodreads. Happy Release Day! Thank you, Rhys. Fascinating, Rhys, to see how this story percolated through chance and happenstance and the events going on in your life. Wow! Congratulations! I have a feeling it's going to land on the top of my TBR pile! Rhys, what a terrific tease! Can't wait to read it. Congratulations! Congratulations on Book Day! I can't wait to read it. Your two previous WWII novels were instrumental in showing me that I actually DO enjoy historical fiction. (I had been a fan of Jacqueline Winspear, but always thought her books were some kind of an exception to my usual taste.) But I remember having the revelation after reading The Tuscan Child -- I actually really enjoy these settings. I'm totally inspired by the strength shown by normal people in such difficult times. Now, I'm open to a much wider range of books, which among others led to me devour The Chilbury Ladies Choir just last week. I have expanded my repertoire, and I have you to thank for it. Thank you, Rhys! Happy book birthday, Rhys! I love the "story behind the story" and can't wait to read it! Ô Rhys ! I have no words. Going now to download The Victory Garden. Intriguing plot premise and lots of herbal lore! I already know it will be a great read about one of my favorite time periods between the wars, especially why British women finally could vote. Congratulations Rhys! Wonderful to read this excerpt and enjoy your latest release. Your novels are memorable, meaningful and I look forward to enjoying The Victory Garden. I absolutely LOVED The Tuscan Child and In Farleigh Field, so I can't wait for this one!!! - You are a rare talent in both mysteries and historical fiction! Keep them coming! Your historicals have given me many hours of enjoyment and are unforgettable. The Victory Garden would be captivating and a treasure for me. Congratulations! Writing is a wonderful and special ability. Kudos Rhys. I went off to order this for Julie, and found I'd already bought it! You know how she feels about your books. They provide a place for her to go and lose herself, not to mention looking for the little easter eggs you leave. Thank you. Congratulations, Rhys!!! This thrilling! The excerpt is fabulous. I can’t wait to read more! First let me say "Congratulations" , Rhys! You are such a talented writer and I can't wait to settle in with The Victory Garden! 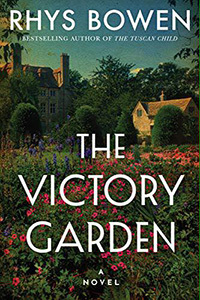 Second, when I read the title of today's post (Rhys Celebrates Pub Day for THE VICTORY GARDEN) I thought, "Oh goody! A pub-crawl!". Yep, that's where my head is today. I'm open to that too, Lyda! Rhys, it sounds wonderful. In school, we read some of the bitter poems that came from that war and I never forgot them. Best of luck with it! Must go order ASAP. And I am getting a copy of Farleigh Field for my sister, who recently visited Bletchley. Triss, I've always adored, and wept over, those poems. So many wasted lives! I bought your first book, in San Diego at Left Coast Crime, and I'll buy this one too. From Evans to Farleigh, every one has been wonderful, so I'm sure this will be too! Congratulations on Book Pub Day! I’ve been looking forward to this book. Your standalones always leave me wanting more. I don’t like saying Goodbye to your always memorable characters! Happy book pub day! I so look forward to reading Victory Garden. I love all of your books, including your Constable Evans novels. I had similar thoughts about how people lived back then. When I was studying abroad in England, our class visited a house in the Cotswolds. I was very surprised that the house had been in the same family since the first Queen Elizabeth's reign. The house is older than the USA! The title reminds me of stories my mom told me about the second world war. She remembers the victory garden at their house in Chicago. She was about two years old and she remembers that! I am so excited about reading your new book! Congratulations on your new release! "The Victory Garden" sounds like a fascinating book. I've never heard about the Woman's Land Army and how they kept things running at home even after suffering great personal loss. I always learn something new when reading historical fiction. Looking forward to reading "The Victory Garden". I like the beginning. . . a stranger comes to the door and asks for help. I look forward to reading about this time period and the herb lore. Enjoy your book birthday! Rhys, I love this book so much! Now I want to reread it. I loved hearing about your process in developing the story. Wishing you huge success on your pub day! Congratulations Rhys....another book from one of my favorite authors! My mother said her grandmother used to use herbal remedies. She wished that she had her grandma's book of tips. Strangely Mom was the only one in my family who didn't garden. She just cooked the produce and helped me buy things for the garden. Congratulations Rhys on a new book birthday! I've always been intrigued by the Women's Land Army and am looking forward to learning more about it through the pages of your book. And, especially as we in the US and in the UK (although they got there a year ahead of us) look forward to a centenary of women's voting rights it seems like a particularly vital story to tell. Congrats again! Your pub day, Rhys, = The day my pre-ordered copy should arrive. The only problem with your stand-alones is that I devour them too quickly, and then don't have the next in a series to anticipate. The very title intrigues me: my family had a Victory Garden during World War II, but the connection with the first world war is new to me. I can hardly wait to see what you'll come up with next! I'm eager to read your new book, it deals with a subject I am particularly interested in. And I would gently suggest that it wasn't only Germany, England, Australia and New Zealand that paid the price for that horrific, ill-considered, tragically mismanaged war. Canada, India and other parts of the Dominion also lost a generation of young men in the so-called Great War. This sounds amazing! When we think about post-WWII, we tend to thing about a return to a normality that didn't actually exist before the war (fewer women working outside the home in the 1950s than in the 1920s-30s). The social impact of WWI is something we in the US think about less, because we entered the war so late. But even in your summary, you've painted a picture that is compelling. I think this is going to have to jump the queue to the top of my To Be Read pile! I love reading historical fiction and especially when they have settings that include England and or Ireland. Congratulations Rhys on the release of another wonderful book. My fingers are crossed my name is chosen. Thanks for the insight into this wonderful book.